Hey all, I bought a few WWX miniatures while I was living in Japan, thinking my American friends there with me would play, but they didn't. I recently moved back to the U.S. to Dallas specifically, and was wondering if anyone knew of any kind of WWX community around here. I feel like this Third Man posse is hitting me out of nowhere (I kinda forgot about him), but I like it. He is from Europe, right? Any chance we will learn more about the specifics of where over there? And should one assume his posse is made up of Hex underlings he brought with him? Or American recruits? And is Maria Torres-Villa wife of Pancho? Also, semi-related. Any chance we will be seeing more mutated human underlings ala the Hex Reavers, but without the Native American bits? 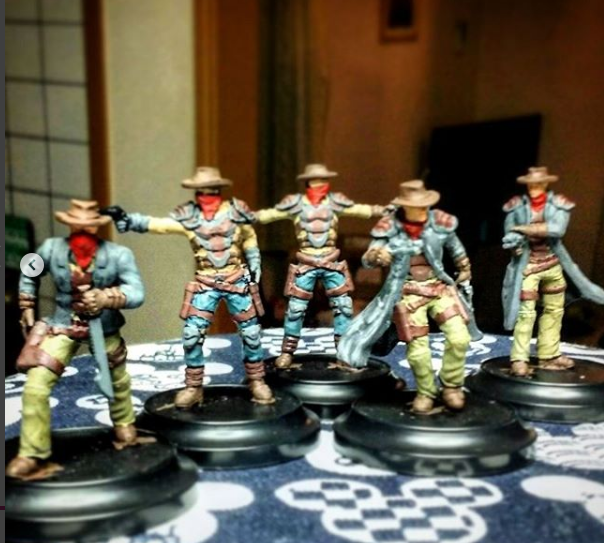 Like beefed up spikey cowboys? This is quoted from the Dystopian Age overview that Stuart had posted. Does anyone else read this and get a vibe of something like Mad Max? (I mean Australia, come on, right? That is where he lives!) Or more than that even, I thought of something like Gorkamorka, which I missed out on playing, but always thought sounded like fun. Honestly, the Dark Nation Reavers models have always kind of reminded me of Orks anyways, and I can just see a rowdy gang of them piled in the back of an RJ fueled trukk, hooting and hollering Obviously Warcradle has several more important irons in the fire at the moment, with Firestorm Armada, Dystopian Wars, Armored Clash, Uncharted Seas, etc etc. and those certainly should and will get attention first no doubt. But what do you guys think of the possibility of a Mad Max/Gorkamorka style game set in the Dystopian Age? Would you play? Even if it doesn't ever see light as a game, what do you guys think of it fluff wise, crazy racing battles in the outback? If not that, how do you interpret the quote from the Dystopian Age overview? This, my good sir, looks fantastic. Did you design that airship yourself? So I had been doing some fluff reading, and some theorycrafting, and came upon this question, which I want to explain myself on, and then pose to you, the forum, to discuss. In the rulebook fluff, in the Enlightened section, it talks a great deal about Carpathian, obviously, and how he came to be the Father of the faction. He is described as being incredibly powerful of mind, and not a little charismatic, and he certainly must be, if he was able to join the Hex (which is essentially a great big gestalt of shared consciousness) and be apparently the first and only person ever to do so on his terms, sharing only those thoughts of his he wanted to. Now supposing that is so, and that no one else has before (which is an interesting rabbit trail to follow on another faction's board perhaps), I approach the crux of my question. While he may have been that smart then, is Carpathian really still capable of keeping the Hex, and the rest of the Dark Council, out of his mind? Carpathian is stated to have suffered some severe injuries, that have affected his mental capacity in one way or another. I cite this excerpt from the Soul Hunters Posse preview: I understand this is an opinion and not an explicit objective fact, but hear me out. If this is right, and Burson isn't who he once was, I see two possible outcomes: 1. He was just so incredibly powerful of mind, that both before and after his cranial surgery, he is still capable of keeping out the rest of the Hex. Or, 2. Either in little leaks, or as an open book, Carpathian's mind is now a part of the Hex pool consciousness. Meaning that Dark Council members could simply sift through his thoughts and find out where he is, or what his plans are, even what kinds of defenses he has set up around The Warcradle complex. If #2 were to be true, and Carpathian didn't realize it, then it would likely be all over for him very soon. But if this were true, and he did realize it, what is to say he doesn't have security measures in place? To whit, he has his own underlings keep all of the most important information a secret from he himself. Imagine, Burson Carpathian, genius inventor, mad scientist, self-styled savior of mankind from alien forces, locked away in a complex he doesn't know where, totally uninformed as to the passcodes, the strength of armed defenses, the positioning of security measures, or anything at all, about how his own organization is run anymore. Truly, a former genius become a complete prisoner to his own completely justified paranoia. At the very least I guess it would give him plenty of time alone to focus completely on his attempts to resurrect his wife right? A true tragic character. What do you all think? Yeah, that is something I really wasn't big into either. That is why in the short story I posted a couple of weeks ago, I tried to portray events in the Wild West through the eyes of a simple bystander, not a part of any of the things. I think that is a lot of why the outlaw and lawmen factions appeal to a lot of people also, because the outlaws can be whoever motivated by whatever, and the lawmen are for the most part just simple folks trying to do the right thing and maintain order. I think maybe Warcradle's changes have helped things to be a little bit more divided up than the earlier fluff that made it feel like everyone just worked for the dark council though. Personally, I really rather liked the old Dark Nation fluff, being mostly just aboriginal people who gave in to their beast side to fight against industrialized man, and was a little disappointed when they just got rolled up as a subposse of the larger Hex faction. I do like the other aspects of the Hex, and understand from gameplay perspectives why they were combined though. But yeah, as a strong proponent of the your dudes approach, I am looking forward to the incorporation of more of the Dystopian Age world maybe giving folks more independent agency. As an aside, that is also a big reason why the majority of the models I have purchased thus far are various hands boxes. I love all of the historical characters and the crazy steampunk takes on them all, but I also like having plenty of John Everyman cowboys and indians and the like, to make my own stories for. Assuming the first is not a specific reference and more just like, older gunslingers, then I would say a smattering of both with a hint more of the first. Legend has it that during the Great Chicago Fire, Rand McNally hastily buried some of their printing machines in the sandy beaches of lake Michigan, so they could be up and running just a couple days after the fire. I realize the big ole fire hasn't happened yet, but I felt like if they had that kind of quirky quick-thinking, then in a WWX kind of world, they would likely be out and about mapping trails and things themselves, hands-on. With the advent of new technologies I also thought they might have gotten an earlier start on things like their system of rating various' cities economic functions. Likely the Enlightened, with their Promethean Complex cities, and incessant internal rivalries, would be dangerously competitive about courting a prime ranking for their home base in the Rand McNally Atlases that so many people would be reading. Posturing! Politicking! Danger and hi-jinks on the trail ensue! Perhaps if I come up with something real good I might write another fan-fiction about it all. XD My ideas for tying in Levi and Jacob are a lot less solid at this point, just thought it would be fun to include more contemporaries. Alright, thanks. I have sort of my own crazy posse headcanon for my unnamed bandits based on some real historical contemporaries, and I wasn't sure if they were actually quite within the proper age range to be slinging guns, lol, since most of them are ten to twenty years older than Wyatt Earp. I dunno, once I realized that William Rand and Andrew McNally were already at it making their famous atlases, I felt like they might go on some trips around the west to find stuff out. And while I was at it why not throw in Levi Strauss and Jacob Davis right? Gotta have them denim jeans! 1876 would make them... 48, 38, 47, and 45... still reasonably able to hold their own right? Man, make those guys a mini Warcradle, and I would be all over it! haha Thanks! I actually have a question that may or may not be super relevant. What year exactly is it supposed to be now? Like, in the Dystopian Age at their minute to midnight setting? I mean, we have the ballpark assuming the U.S. Civil War was fought and ended more or less the same years as in real history, I think. But what year is it now though? Assuming the Civil War ended in 1865 still, how many years has it been since then? Thanks for posting this @Overread, as someone without a facebook account, I am always glad when someone posts the latest stuff in a place I can actually see it. Also, I appreciate that the accompanying fluff seems to have taken a bit of a direction influenced by what I have perceived to be people's general consensus on the issue of wanting the Asian nations maintaining a bit more independent identities. I like the way this model looks. I understand some elements seem out of proportion or slightly impractical, but I think to some extent, that is the charm to me of a steampunk alternate world aesthetic. It doesn't have to make 100% sense necessarily, if it makes reasonable sense, then I think the rule of cool comes into play a bit. It is a tabletop wargame after all. I dunno, that is just my two cents. While I think they haven't updated any of it since they acquired the Dystopian IP, the free rulebook download on the Wild West Exodus website has pretty decent fluff coverage of all the factions there, and as far as I am aware it is current. So while it doesn't address the world at large, it should at least give you a little picture of what is up. I think the point that was trying to be made was less that the Dindrenzi were necessarily actually starting another war because they wanted revenge, and more that they were perhaps claiming revenge as a means to win the support of their own noncombatant populations. Now, idk what they would hold for actual motivation, but perhaps they look to not just separate from Terra, but turn the tables completely and come out the new singular human race? As for planetary differences and aquans, I don't know but I am just saying, water itself is a resource right? Perhaps some other race wants to ravage an aquan planet for the water necessary to terraform one of their own more wasted worlds into something more livable? Or perhaps some buggy aliens favorite food is aquatic, and they want to take a whole planet over to start it teeming with the stuff like a never ending soup bowl of plenty. And that is not to mention any sort of sand, coral, pearl type, or other type underwater resources that could be used for whatever technological or other reasons. This is probably my favorite of the "vignette" series, the lot of which is what inspired me to write my own! Nice work! I wrote this short story, I hope you like it. Comments and criticisms are welcome, thanks! Also, if anyone could tell me how to indent an entire paragraph in a forum post, that would be great. Post formatting is not my forte The preacher wasn’t smiling as he stepped up to the pulpit of the dusty little church house that Sunday mornin’. In fact, it seemed like it hadn’t been since before they could remember that the congregation had seen their shepherd smile. Instead, he wore an ever present and rather serious expression, a countenance he shared with the few members of his flock who still came and sat in the pews every week. A look that said too many thoughts were runnin’ around inside their heads. Maybe the preacher was sombered by memory of his past deeds. Before he became a man of the cloth, he had been a shotgun messenger on a stagecoach. While it had been savage natives he had felled with his gun, and far from innocents, a man of conscience might still demure over lives taken. Still haunted by the faces of widows and fatherless children rising up in judgement before him every time he sought to do a good deed. Or maybe the good shepherd was mournin’ with his people problems not only spiritual, but physical too. Like the growing portion of his congregation that was missing from the weekly meeting. First there were the young men who went away to throw in their lot with the confederates, James, the dentist’s oldest, and Andrew, son of the innkeeper. Then there were the Hendersons, the whole lot of them ‘scripted by the Union. Both sets of boys off to a fight that they couldn’t both come back from. The Union soldiers eventually did come back to town, but not the boys the preacher had known, not the young members of the shepherd’s flock. After the war it had been claims of utopia that had culled the sheep next. It had started with labourers from town being hired to go help build up the next town over, one as had been earmarked to become a “Promethean Complex”. Some of the men from the church had returned from their work there, only to take their families back with them, enticed away by promises of better living through “Enlightened” technology. Thomas Smith and his family would make visits back in to the church on occasion at first, but of late, no one for miles had seen a soul out of that big, smoke-belching monster of a city. Perhaps it was more immediate concerns that soured his face. Such as the growing fear in town, about how brother Ned’s cattle were turnin’ up mutilated, and with increasing frequency, too. Or how some folks had simply vanished from their beds in the night, only to turn up wanderin’ the waste days later with strange scars, and no memories of what had happened to them, or in some cases no memories of who they had even been. Maybe it was the thought of how Earl and Mary Hicks’ boy had made up his mind two weeks ago to run off with the Wilson gang. How, when confronted about it, he had shot his father with his six-gun before robbing his own mother and makin’ off for what his new “friends” promised was easier living. And how Ned’s brother, the sheriff, had taken off with his deputies in pursuit of the outlaw posse that same day, with no word of either since. It’s possible the serious look was due to how, just yesterday, the Mastersons’ boy woke up from a dream in which he claimed an angel had talked to him. At behest of his vision, the youth had begun to inscribe strange markings into a sabre that had been passed down in the blacksmith’s family for generations. As confused as his parents had been that morning, the more so was everyone horrified when their boy took the finished sabre up in the middle of the night, and went and plunged it into the heart of old MacIntyre, the seedy drunk who lived on the edge of town. In the end, it could have been any of those things, or even all of them, that was weighing on the preacher’s mind that morning. At last setting his Bible down on the pulpit, and opening to a page near the back, the preacher began to read, breaking the heavy silence. “And after these things I saw another angel come down from heaven, having great power; and the earth was lightened with his glory. And he cried mightily with a strong voice, saying, Babylon the great is fallen, is fallen, and is become the habitation of devils, and the hold of every foul spirit, and a cage of every unclean and hateful bird.” As the preacher read, and the congregation murmured its agreement, the door at the back of the room swung open, and a man rushed inside in a panic. “Shepherd! oh Lord God! someone help me, something aweful and unholy is afoot!” It was Jim Wuthrup, the undertaker, and as he hurried to throw himself down before the pulpit he shared with horror what he had witnessed. “It’s MacIntyre, he’s got up and started to walk again!” As the men of the congregation jumped to their feet astir, Mr. Wuthrup babbled on to the shepherd, about how the body of the town drunk, which had been put in a coffin last night to await burial this morning, had begun to stir. Finally it had climbed out and set its still-dead eyes on the undertaker, who had wasted no time in fleeing for the church, the sickening sounds of wrenching joints and dragging wet flesh behind him spurring him on. It was only a moment later, as the Shepherd tried to console his frightened lamb, that the door to the church burst open for the second time that morning. Brother Ned’s wife screamed and passed out in his arms as a monstrous form threw itself malevolently into the church-house. The… “thing” ...that had once been the town drunk, was now a club-footed and hunchbacked lump of flesh and boils, and what once had been its fingers had split to make way for long talons of sharpened bone. Even as the men of the congregation tried to maintain an orderly retreat of the women and children to the far end of the room, the flesh of the creature continued to warp sickeningly, the boils that covered it giving off an eerie red glow. Amidst the chaos of the fleeing flock, a few brave men had begun to pelt the creature with hymn books, candlesticks, anything on hand, taunting the beast and trying to keep it away from the women and children. The old shepherd ran to the pulpit, tearing the small cross from around his neck and pushing it into a matching depression on the old wooden stand. With a click, the side of the pulpit fell off, revealing an old coach gun and a line of old shells. As the creature continued to lumber forward, crashing through the old pews and shrugging off the improvised missiles of the congregation, Mr. Masterson came up behind it and smashed a chair over top of its head. Whirling around with a speed that belied its deformities, it rent his chest with its claws and sent him flying away. Loading a pair of shells into the breach of his weapon with a whispered prayer, the preacher lifted the worn oaken stock of the 12 gauge to his shoulder and aimed it at the beast. The gun was an old Remington, not one of those damnable newfangled weapons juiced by the devil’s own blood. Not for this man of the cloth. As the terrifying beast closed on the men fleeing to the pulpit, the preacher raised his voice in exultation. “And I heard another voice from heaven, saying, Come out of her, my people, that ye be not partakers of her sins, and that ye receive not of her plagues. For her sins have reached unto heaven, and God hath remembered her iniquities.” At the sound of their shepherd’s voice, his fleeing lambs parted to either side to make an opening. Pulling both triggers, the shepherd sent two barrels of righteous fury straight into the maw of the beast, lifting it bodily from the ground and spinning it around. The creature hit the ground with a sickening wet slap, the boils on its flesh bursting from the impact to release a luminescent red liquid that was too bright to be blood. The church house fell silent. “Rejoice over her, thou heaven, and ye holy apostles and prophets; for God hath avenged you on her.” The shepherd turned to his flock, the look on his face betraying nothing of what had just happened. As if this were the intended conclusion of his sermon all along, he sent the congregation home with a simple benediction and a prayer for Mr. Masterson, who had been taken to the doctor’s as soon as the beast was dead. Closing the doors and turning to look at the mess he’d have to clean up, the preacher thought to himself quietly. In these trying times, it was a relief to know that his ultimate destiny was secured. As the shepherd rolled up his sleeves and set to work cleaning his church, for the first time in a long time, he allowed himself to smile.